Today we are announcing the availability of Heroku Connect Demo Edition, a free version of Heroku Connect designed for learning and experimentation but not production. With Demo Edition, engineers evaluating new architectural options and developers building proof-of-concept apps can validate Heroku Connect as their choice through hands on product experience. It’s the perfect complement to a free Heroku account and a free Salesforce Developer Edition org. Getting started with Heroku Connect Demo Edition is easy and free. Anyone with a verified Heroku account can immediately stand up a Heroku app, a Heroku Postgres database, and the Heroku Connect add-on with a single press of this Heroku Button. If you don’t have a Heroku account, you can get one for free, and verify it simply by adding a credit card: you won’t be charged, this is simply a requirement for using any Heroku add-on. If you already have an app, you can add Demo Edition to it via the Heroku Add-ons marketplace or the CLI. 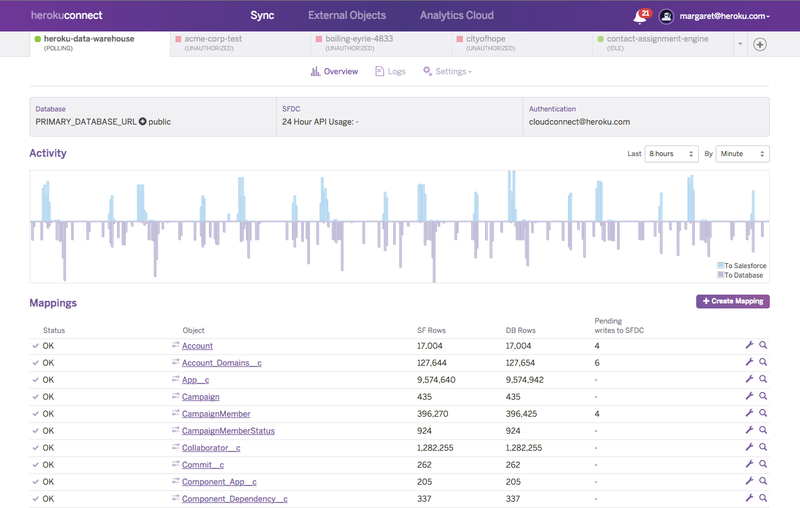 There are limitations to Heroku Connect Demo Edition: the maximum rows of data synchronized between Heroku Postgres and Salesforce is 10,000, and users cannot create Streaming API connections to deliver Salesforce updates in real time. Most features remain consistent with the commercial version: there's a “Poll Now” option to support development workflow, support for Sandbox or Production data, and users can share a Heroku Connect instance across all collaborators within a Heroku account. A final note: Current Heroku Connect users may not recognize the new UI, currently in beta. The new UI streams log data into the log viewer in real time, provides a per-mapping view of data change volumes, and gives users a better view of connection status as well as an easier means to switch between them. Read more about the benefits of Heroku Connect in the Heroku Addons Marketplace. You can also check out the companion post on the Salesforce Developer’s blog, or review the documentation available on the Heroku Dev Center. Or of course, you can request a salesperson to contact you.